AT SOME POINT in the past, Ross designers and engineers sat around a table and decided to create a reel that upped the technology bar. Sometime later the Vexsis was born, and right out of the box you can’t help but notice that Ross’s latest offering is indeed technology-packed. The frame and spool’s concave shape is the first indicator of this, a feature that allowed Ross to add more porting and remove material without compromising strength. The second thing we normally do to a new reel is simply pull it apart. Here too, you’ll notice how smoothly the spool release mechanism works. The release is a magnet-driven system that uses 4 Ni-Cu-Ni (Nickel Copper Nickel) plated NdFeB (Neodymium Iron Boron) grade N40 magnets to secure the spool onto the frame. According to Ross, these magnets have an operational life of more than 1000 years. The drag system is based on the Momentum’s carbon fiber design but has been modified by the addition of ceramics to enhance overall performance. The reel’s ‘friction plate’ is actually a stack, a multi-layered drag system that provides more surface area for drag friction and to help with heat dissipation. Here’s the quick recipe (it helps if you think of it in terms of layers of a sandwich): a carbon fiber disk is at the top of the stack; then a Rulon disc with ceramic embedded into it goes under the carbon fiber; then the machined and anodized aluminum drag disc is followed with another Rulon/ceramic disc; and finally the anodized surface of the frame rests underneath the Rulon. The system maximizes the benefits of each of the materials — carbon fiber for strength and drag surface, Rulon for lubrication, and ceramic for heat dissipation. By combining these elements together in the correct sequence, the result is a top-notch braking system. Each of the five reels in this series is designed with a specific diameter and width to maximize the properties of drag consistency and quick line retrieval. The Vexsis also sports intelligent features like a recessed counterweight that will not snag line, and an instant retrieve conversion: no tools or disassembly required, and the operation can be performed in one second flat. At this point, if you’re thinking ‘ideal mid-priced bonefish reel,’ you wouldn’t be wrong. In this price range, the last reel I tested that offered this level of tow-truck-stopping power as well as smoothness was the Gunnison (also a Ross product, discontinued several years back for reasons I’m still unaware of). Much has been written about this reel’s linear drag knob rotation. While it does take a little getting used to, it isn’t nearly as ‘weird’ or ‘spooky’ as some reviewers have described. It incorporates a multi-ball thrust bearing drag for an “almost-perfect” linear drag response (according to Ross), resulting in a constant, mechanical feel through multiple knob rotations. That rates high in my book, considering it gives you confidence that you won’t mess up if you choose to fine-tune the drag during battle. Finally, along with all these positives, the Vexsis still has a shortcoming. As you’d expect, this level of technological complexity comes with its own considerable caveat: keep the reel spotlessly clean. In my experience this reel’s tolerance for even the slightest amount of foreign matter is absolutely zero. Of all the reels I’ve handled over the years, every single one has been more forgiving than the Vexsis in this regard. So if you’re fussy about your gear, and never put your reel down in the sand or leave it exposed to grit, you’ll really enjoy the improvements in the Vexsis. Otherwise, expect to do a bit more maintenance to be sure the inner surfaces are clean and debris-free. 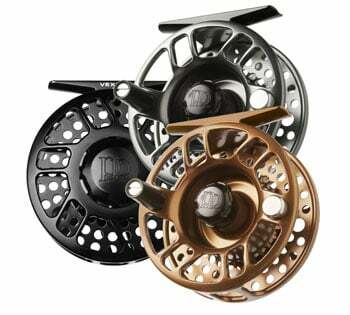 More information on the Vexsis line can be found at the Ross Reels Web site.